Beckie here with a confession: I have a scrap pile in my garage that I would be embarrassed to take a picture of. I could make 100 of these and still not touch my scrap pile. I have a scrap wood hoarding problem. You just never know when you will need a 6” piece of wood. So why throw it away when I can toss it in a bin of scraps? Every once in a blue moon I get a wild hair and have to use up some of my scraps just so I have confidence that they are still useful. 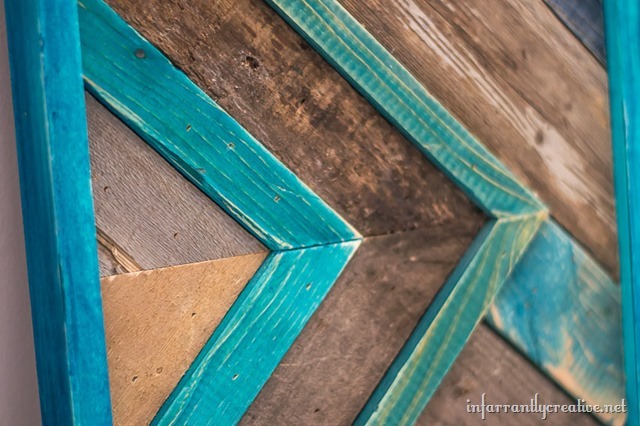 Weathered wood is so on trend right now as are pops of colors. I married the two and they had a pallet art weathered and bright love child. Isn’t she pretty? 1. I grabbed all sorts of wood from my garage. Some were old fence posts, others were new pine boards, and some were some left over deck boards. I started cutting them at a 45 degree angle and came up with a random pattern. It is kind of like putting a puzzle together. 7. You will have a lot of overhang and will need to trim it down. You can use a circular saw to cut the extra off. Or you can use a table saw like I did. 8. Next I framed it would with new pine boards ripped to 2” wide on my table saw. Again I let it dry and then sanded it. Then I added a different shade of the Ultra Dye and sanded that down to give it a depth of color. Using wood glue, I airnailed the frame in place as well. 9. You can add o-rings on the back to hang it on the wall. Or you can set it on a shelf upright or on it’s side. It is sooooo pretty with the blues/greens and the gray weathered wood. SWOON! For now I just propped it against a wall in my family room but plan on finding the perfect place in my home to showcase it. I have seen some amazing patterns using this technique. It is kind of like quilting with wood. The Ultra Dye gives it color, but also allows you to see the wood tones.